We’re delighted to present our new website which boasts a modern design and contains an abundance of content including case studies and our new videos. Designed to be a more user-friendly experience with improved navigation and functionality throughout, each page provides more detailed information about our products and explains how they work together in synergy. 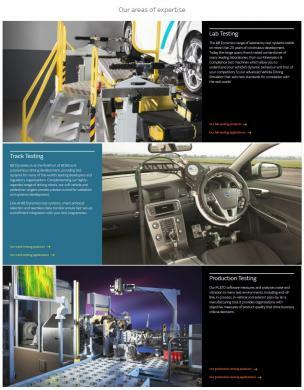 The website is divided into our three key product areas – Lab Testing, Track Testing and Production Testing. We also have a section for applications, so whether you’re doing ADAS testing or Driver-in-the-loop simulation, you can easily see which AB Dynamics products you need. Our vast portfolio of products including seven steering robots and eight pedal robots are clearly laid out and easy to browse. There is a comparison table on our steering robots page, so that the decision for which to choose becomes more straightforward. Visitors to the new site can stay informed with the latest AB Dynamics news and careers.